I heard this morning that my blog has been recognized as one of the most fascinating teacher technology blogs of the year by the Accelerated Degrees Program in the USA, which promotes online degrees and distance learning. The award has come based on my blog posts about the SAMR model and how I have encouraged teachers to use this model in practical ways with their students to transform learning. The criteria for this award is that the blog has to inspire your audience and also encourage discussion through comment posting. As people who know me personally will understand, writing a blog and continuing to post about my thoughts and wonderings about education and in particular how technology can improve learning has not always been easy. 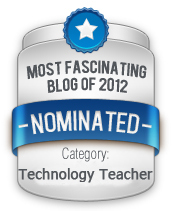 I'm delighted therefore that my blog continues to inspire thousands of other teachers worldwide. The feedback I get from my readers and from the other wonderful educators that I have connected with as a result of my writing is priceless. Thank you all. It has always been apparent to me how much energy, thought and work you put into your blog writing. I admire all of those qualities in your writing, and look forward to reading much much more from you. I also look forward to hearing about your new adventure. Good luck, hang in there (moving is excruciatingly difficult), and above all, congratulations. Thanks Marcello - I think many people are keen to follow along with my new experience in India. I was talking to a colleague today and questioning whether I will still blog as much next year. I hope I will, but I'm wondering whether I will blog with such urgency when I am able to share all my ideas with the people I'm actually working with. Let's hope our paths cross again soon - I was sorry to miss you at Un-Plugged. While I understand all the reasons why you are reluctant to put your name to this comment I would love to know who has written this. Can you get in touch with me in person at school please? Thanks for your support.